Q) What service is offered on holidays? Q) How can I get a tax credit for using transit? For all non cash fares on conventional transit only with a receipt. Thus, Single tickets for Seniors, 10-Ride, Monthly passes, and Inter-Municipal Senior 2-Ride, 10-Ride and Monthly passes are eligible for Seniors to claim with a receipt. Also, Seniors will be eligible for a tax credit only for cash fares on specialized transit (WellTrans) without a receipt. WellTrans riders are responsible to track their own cash payments as Welland Transit cannot provide information for cash fares. Keep your receipts to submit with your return. Welland Transit cannot replace lost receipts for income tax purposes. Please note that the now expired Federal Tax Credit can be claimed by all riders meeting the requirements of the program, but only for purchases made specifically for the months of January to June 2017. Q) What events are happening today? Q) ) Do you have a lost and found? Q) Where are the sales locations where I can buy a pass? Q) What is the Trans-cab service? A) A Trans-cab is a service that replaces the bus system in areas the regular Conventional service doesn’t travel to due to time restraints. Please see our Trans-cab page for more details. Q) Do you have a specialized service for persons with mobility issues that cannot use the regular conventional service? A) Yes, We have a WellTrans service that persons with mobility issues can apply for, Please visit our WellTrans page for details and applications. Q) Where am I allowed to smoke while waiting for the bus? A) We do not have a designated smoking area. You will need to leave the Bus Terminal property if you wish to smoke. Smoking is not permitted on any City of Welland property this includes the Bus Terminal. Q) How do Transfers work within Welland? A) After boarding the bus in Welland and paying the fare with cash or a punch card you can request one transfer from the driver so that you can transfer to another bus at the downtown terminal. A transfer is only good at the drop off location and cannot be saved to use at another time. Q) I am taking the bus to the Terminal and Transferring to a Regional bus, do I need to pay the Welland Fare and The Regional Fare? A) No, When boarding a bus in Welland you can pay one fare of $6.00 to the driver and ask for a Regional Transfer. Once at the Terminal you can transfer to the Regional bus. The Transfer is a onetime use only transfer. Q) What buses is my Regional monthly pass good for? A) You can use your Regional Monthly pass on the Regional Buses, City buses in: Welland, St Catharines, Niagara Falls, Port Colborne, Fort Erie and Thorold. The Regional Monthly pass does not cover the Brock Link or NOTL link. For more information on the Regional buses you can visit www.niagararegion.ca/transit or call 905-980-6000 ext 3550 or 1-800-263-7215 ext 3550. Q) How does the grey hound work? A) We do not sell greyhound tickets and we cannot provide any details about the services they provide. You can contact them at www.greyhound.ca or call 1-800-661 8747 for information. Q) How do I book a trip to and/or from Toronto? Q) Why doesn’t Welland transit sell Regional one ride fares? A) The Region does not offer this as an option however we do sell 2-ride passes that are available for $12.00. Also, riders always have the option of paying the Cash Fare ($6 Adult, $5 Seniors/Elementary and High School students) for a single ride on Regional Transit. Q) Where is my bus? Q) Can my children travel with me for free? A) With a paying Adult you can take up to 4 children under the age of 12 for free. Q) Why do I need to fold up my baby stroller? A) The buses have limited room. Strollers cannot block the walkway or take up room that a wheelchair may need during your trip. If you are asked to fold up your stroller because there is not room in the bus you may need to wait for the next bus. Q) Are wagon’s permitted on the bus? A) Wagon’s are not permitted on the bus at any time. Q) How do I read the Welland bus map? 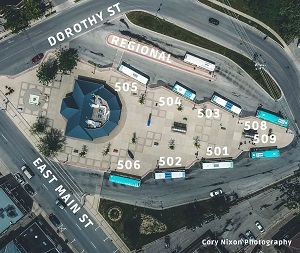 A) The Welland bus route map is colour #501 is orange, #502 is Brown, #503 is Green, #504 is purple, #505 is burgundy, #506 is light blue, #508 is pink, #509 is dark blue. Q) Where do I catch the buses?